In 2014 29 Orgs Committed $1.5 Billion to Impact Investing. Where’s the Money after 18 Months? Earlier in 2014, I had been invited to be part of the United States National Advisory Board on Impact Investing (the NAB). An impressive group of impact investing professionals from industry, philanthropy, government and academia, we had been meeting for nearly a year under the auspices of the Social Impact Investment Taskforce established by the G8. Our purpose: to collect advice and make concrete recommendations for how US policymakers could encourage more impact investing (released as Private Capital, Public Good), and to participate in the larger global conversation among G8 countries around a global set of recommendations, released later through a set of coordinated international reports. But it was clear that to get press attention to our desired policy recommendations in Washington, DC, the NAB needed to announce something tangible and new related to this impact investing marketplace. Jonathan Greenblatt, then the Director of the White House Office of Social Innovation and Civic Participation, decided to see what new commitments private companies, funds, and philanthropies would be willing to make, alongside some significant commitments the US government was preparing to announce that day. 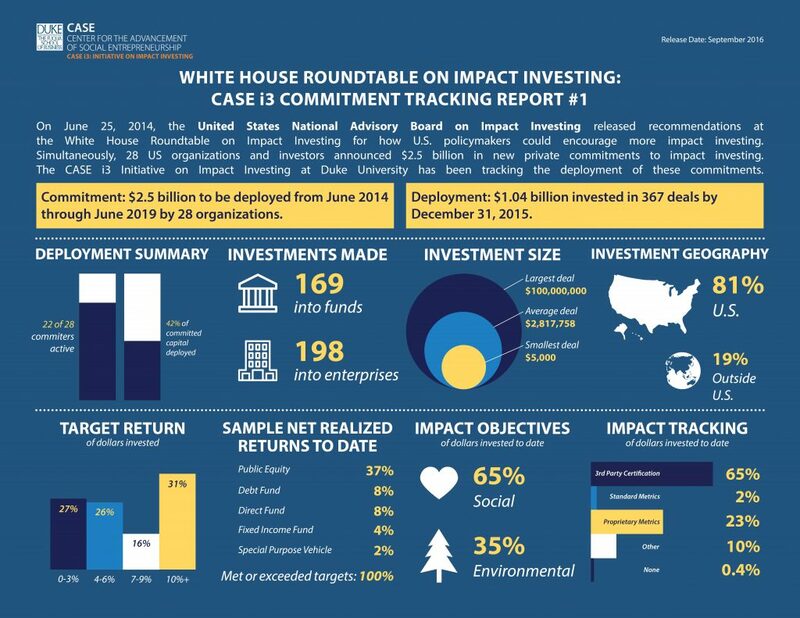 By the time of our press event, in June 25, 2014, he had engaged 29 organizations who collectively promised to invest over $1.5 billion in new commitments to impact investing. It was a diverse group – private funds, foundation programs and endowments, investment banks, small family foundations, and nonprofit organizations. The way that Jonathan framed it to me was as intriguing then as it is today. He said, you know how some philanthropies have private pledges and they report the numbers up front? The White House want to be sure the actions follow the words. Would we be willing to independently track the money that goes out by these investors and see what it actually achieves? We got a big surprise when we went back to the committing organizations and asked them to tell us more about the amount and nature of their commitments. Twenty-nine phone calls later the $1.5 billion announced in the White House press release actually added up to $2.5 billion by 29 committers. (One of the committers closed down their investment activity between then and now.) This was good news. Based on this initial data collection, we created a custom survey instrument and started surveying the group every year. We promised committers we would report results in the aggregate and keep individual deal information confidential unless we had their permission to report publicly. Last year, we joined the White House in reporting on a subset of the commitments focused on clean energy and climate solutions. The lessons of this group will be rich for many wanting to understand and explore the potential of impact investing. To give a concrete example of just one of the investments, consider the $100 million investment into the Carbon Efficiency Strategy (CES), which is the largest individual investment made by this commitment group to date. CES is a joint venture between The McKnight Foundation and Mellon Capital Management to offer carbon-conscious investors a way to invest in companies whose practices could reduce carbon emissions. As a broad US stock fund with about 1000 holdings, it has helped McKnight tilt its investment toward companies that are producing fewer carbon emissions compared to peers. Read more about the product here, and a case study on the partnership here. Looking over the first two years of this experiment, we at CASE i3 see tremendous activity and progress in the field of impact investing. We also see the US National Advisory Board transitioning to a new program called the US Impact Investing Alliance, chaired by Darren Walker of the Ford Foundation, and that the Social Impact Investing Taskforce evolved into the Global Social Impact Investment Steering Group (GSG) in August 2015, chaired by Sir Ronald Cohen. It is clear that cross-sector impact investing partnerships around the world are getting ever stronger. We look forward to many more lessons and positive returns, both financial and social, from this group and from impact investors more broadly.